Swimming Pools of Tupelo & More Superstore has your winterizing needs covered. We offer a complete line of solid pool covers, safety covers, and solar blankets. We also now offer a fully automatic pool cover for easy and carefree covering and uncovering. We have all of the swimming pool accessories for closing including water bags, cover pumps, and winter chemicals. 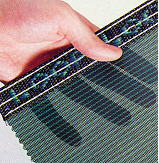 Mesh construction lets rain, melting snow and ice drain through. Water doesn't collect on surface, so it's safer for children to be around. Because surface stays dry...dirt, leaves and debris blow away. Cover stays mess-free and beautiful to look at with no pumping and no maintenance. Custom-designed to conform to the exact shape of your pool. 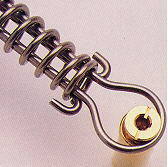 Stainless steel springs hold the cover taut. Brass anchors disappear flush with the deck when the cover is removed. Although the cover is lightweight, it has a break-strength of 600 lbs. per square inch! The springs snap on the anchors in a few minutes to secure pool for a day, week, or months. Cover can only be removed with a LOOP-LOC Installation tool so it's tamper-proof. Cuts down time needed to open your pool. No scrubbing or powdering required. All components are totally non-corrosive. Every LOOP-LOC Cover comes with a full 10 Year Warranty. Exclusive SAFEDGE feature is a child-safety intrusion barrier that meets raised walls, etc. 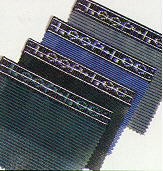 GAP GUARD closes gaps caused by varying levels or decks. LOOP-LOC Covers blend into your landscape setting and avoid unsightly winter pool messes. End the problems of filling and replacing old-style water tubes. Never buy another water tube! Stop buying pool covers every 2 or 3 years! Tiny holes in LOOP-LOC's fine mesh let rain water through while keeping leaves and debris out. Although lightweight, it has an amazing minimum break-strength of 600 lbs per square inch ! Unique brass anchoring system make it a breeze to take the cover on and off. Once you remove the cover, the anchors fit flush with your deck. Stainless steel springs securely hold cover taut throughout the winter. The springs snap on the anchors in just a few minutes, making your pool opening a pleasure rather than a problem !